We are pleased to announce that His Holiness Orgyen Kusum Lingpa, one of the few living, genuine treasure revealers -- who clearly remembers (as Lalung Paldor, one of the 25 heart disciples) receiving transmissions directly from Guru Rinpoche at the original Samye temple -- and one of the most precious, senior masters still living in Tibet, will once more return for a special program at Blazing Wisdom Institute. On Friday, April 20, 2007, at 7:00 pm in the evening, His Holiness will offer instruction on the nature of mind. 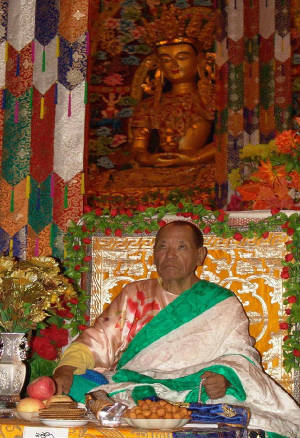 On Saturday, April 21, 2007, His Holiness will bestow empowerment and teaching from his own treasure cycle on Guru Dorje Drollo, one of the eight manifestations of Guru Rinpoche. The special purpose of this practice is to tame our own most barbaric thoughts and tendencies, in order to make our minds and our environment conducive to more advanced training. On Sunday, April 22, 2007, His Holiness will bestow a rare and precious empowerment for Karma Lingpa's Shi Tro (the mandala of self-existing peaceful and wrathful wisdom deities). In the late 19th century, in accordance with prophecy, Jamgon Gertse Tulku brought Jamyang Khyentse Wangpo's lineage of treasure master Karma Lingpa's Shi Tro practices to the Golok region of Tibet. In turn, Gertse Tulku gave the entire lineage transmissions to Walshul Lama Sonam Khedrup, who was the 7th lineage holder of Lung Ngon Thubten Chokorling Monastery. He, in turn, passed the lineage to his nephew, the Mahasiddha Pema Tumpo, otherwise known as His Holiness Orgyen Kusum Lingpa. His Holiness treasures this practice and tradition above all others, and has often offered these teachings and empowerments to gatherings of many tens of thousands of disciples. The oral tradition -- which only recently has been written down and published -- is so rich that a teaching cycle may last for three months or more of daily sessions. Receiving this empowerment directly from such an accomplished lineage holder will have incalculable benefits at the time of death for those with informed trust and faith. We are delighted to announce, further, that for the first time His Holiness will be accompanied by his own Umdze (lead chant master) from Lung Ngon Thubten Chokorling Monastery in Golok, Tibet, who will provide invaluable assistance in the conduct of the empowerment rituals. Needless to say, Tulku Sherdor, Director of BWI, will serve as interpreter. Morning sessions will begin promptly at 9:30 a.m. Afternoon sessions should conclude by 4:00 p.m. or earlier, subject to His Holiness' wishes and his health. Fee for the program : $150 for the entire program, including Friday evening and catered lunch on Sat & Sun. Registration : Required. Please contact us for further information if you wish to attend less than the entire program, or have other special needs. Please note that we do not have the ability to accommodate people overnight. There are very affordable nearby lodgings, and recommendations are available on request by emailing us. We can also provide information on travel to Blazing Wisdom Institute. His Holiness Orgyen Kusum Lingpa will also be giving two empowerments in Flushing, New York on Saturday, April 28, 2007. P.S. There will also be a "Life Ransoming Ceremony - Animal Release" on Sunday, April 29, 2007 in Flushing. Please call Hongyi or Tong at the number above for details.